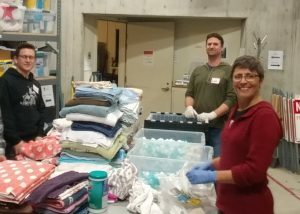 Volunteers from Zulily fold and sort clothing and hygiene products at our donation center. Volunteers are essential to DESC – they allow our clients to connect to their community and make it a better place for all involved. In 2017, 617 volunteers performed more than 23,000 hours of service work. Volunteers help in many different ways across the agency. DESC is a multi-service organization, with many opportunities to impact the lives of our most vulnerable neighbors: people experiencing homelessness, living with mental health issues, and/or living with substance use disorders. The DESC volunteer application process is designed to match your interests to the needs of the organization, so that your time with us can be as meaningful as possible. While the responsibilities of different positions vary, all positions require that you are dependable, have good communication skills, and are able to respectfully interact with people from a variety of backgrounds. 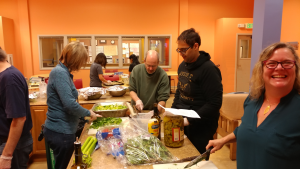 Volunteers from Micro Focus, volunteer by prepare and serve a meal at one of our supportive housing projects. The next step is attending one of our monthly volunteer orientations, where you will learn more about the services DESC offers, and how volunteers can help. At the orientation, you will meet with our Volunteer Coordinators, as well as other new volunteers. You do not need to have completed an application already in order to attend an orientation. If able to attend, please RSVP by email to Margaret Klockars at mklockars@desc.org. Some of our individual openings are listed on Volunteer Match. If you’d like, you can check them out, and apply to any and all that interest you. Or print out our general application to bring to orientation, and we’ll find an opportunity that best fits your skills and our needs. Thanks again. You’re on your way to making a significant impact on the lives of the vulnerable and those that are experiencing homelessness.